When Hitler comes to power on 30 January 1933, Herbert Frahm is one of the first to offer resistance. To protect himself from persecution by the Nazis, he takes the name Willy Brandt. In April 1933, he goes into exile in Norway. In Oslo, Brandt establishes a foreign base for the left-wing-socialist SAPD. From here he continues the struggle against Hitler’s dictatorship, the result being that German authorities revoke his citizenship in 1938. In Norway, Willy Brandt maintains a close association with the Workers’ Party DNA, which exercises a strong political influence on him. On trips throughout Europe in the 1930s, he also establishes many international contacts. On 30 January 1933, Reich’s President Paul von Hindenburg appoints NSDAP leader Adolf Hitler to the office of Reich’s Chancellor. Herbert Frahm and his girlfriend, Gertrud Meyer, are among the first to resist the transfer of power to Hitler. In leaflets, their Lübeck SAPD group calls for an “anti-fascist struggle” and a “cohesion of left-wing forces.” The leaflets are duplicated in secret and placed in mailboxes at night. 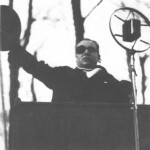 On 6 February 1933, at a protest rally in Lübeck’s Holstenhalle, Brandt appears as a speaker for the SAPD. He and his friends are taking a serious risk, because as well-known opponents of the Nazis in the city, they are under the threat of arbitrary arrest and severe mistreatment by the SA, the militant wing of the NSDAP. Many prisoners do not survive the torture. In the initial weeks of NS rule, thousands of Hitler’s opponents are already imprisoned or sent to concentration camps, especially social democrats, socialists and communists. Many are tortured and murdered. Even the SPD Reichstag representative, Julius Leber, is arrested in Lübeck in early February 1933. He is charged with having participated in the killing of an SA man. On 3 March 1933, the SAPD’s executive committee in Berlin dissolves the party and its organisations. However, some members object to the decision and call for an “illegal” party convention in Dresden to begin on 11 March 1933. Herbert Frahm travels to the meeting for the Lübeck SAPD group, which still consists of 75 members. 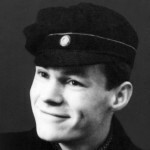 On this trip, the 19-year-old uses the name Willy Brandt for the first time as camouflage. 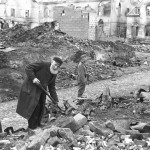 In Dresden he reports on the dismal situation in his district and the brutal terror by the Nazis. The party convention decides to continue the SAPD. A secret Reich’s leadership board in Berlin is formed to organise resistance against the NS regime. In addition, a decision is made to establish foreign headquarters in Paris under the directorship of Jacob Walcher. On 21 March 1933, Paul Frölich, who was supposed to establish a base for the SAPD in Norway, is arrested while attempting to escape across the Baltic Sea to Denmark. Following that, the SAPD Reich’s executive committee entrusts Herbert Frahm with the task of taking on Frölich’s mission and moving to Oslo. There he is called “Willy Brandt” in an announcement to the comrades of the Norwegian Workers’ Party (DNA), a sister party of the SAPD. The boycott of Jewish businesses on 1 April 1933 is the last impression which the young socialist from Lübeck takes with him. Two nights later he secretly travels from Travemünde to Rødbyhavn, hidden on a fishing boat. From there he continues to Oslo by way of Copenhagen. In his luggage, the 19-year-old has 100 reichsmark from his grandfather and a volume of “Das Kapital” by Karl Marx. On 7 April 1933, describing himself upon entry as a tourist, Willy Brandt arrives in Oslo on the passenger ship “Dronning Maud.” One day later he checks in at the press office of the Norwegian Workers’ Party (DNA) with Finn Moe, the international politics editor of the “Arbeiderbladet.” As soon as 11 April 1933, Brandt’s first Norwegian article appears in this newspaper: “Hvordan ser det ut i Hitler-Tyskland?” (“How do things look in Hitler’s Germany?”). 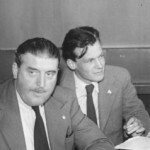 Moe introduces the new arrival to the chief of the “Arbeiderbladet,” Martin Tranmæl, and the DNA chairman, Oscar Torp, and procures him a place to live as well as financial support from the justice funds of the trade unions. Because Brandt learns Norwegian quickly, he is soon regularly contributing articles to newspapers. In late May 1933, Willy Brandt participates as a guest delegate at the convention of the Norwegian Workers’ Party (DNA). He reads salutations from the SAPD and collects money for his organisation’s solidarity fund. In fact, the sister parties are both members of the “Internationale Arbeitsgemeinschaft (IAG)” (“International Alliance”), a very small and politically insignificant left-wing-socialist umbrella organisation located in London. But the unequal partners are pursuing different goals. While the splinter party SAPD is striving for a revolution, the mass party DNA has set its sights more intently on social reforms since the early 1930s. Although they are actually dependent on its aid, Brandt and the SAPD leadership fervently oppose the pragmatic course of the Norwegian party. In early June 1933, Willy Brandt travels through western Norway where, in Bergen and in Høyanger in the Sognefjord, among other activities, he holds lectures for members of the Workers’ Party DNA and for trade unionists about conditions in Germany and solicits support for the SAPD. In the meantime, the young German has learned so much Norwegian that he no longer needs Aase Lionæs, his interpreter during his first weeks there. In April and May 1933, Brandt has already spoken to people taking courses at the Workers’ Academy on the island of Malmøya in the Oslofjord. In June he attends a summer camp of the DNA youth organisation Arbeidernes Ungdomsfylking (AUF) of which he becomes a member. Through his affiliation with the AUF, the 19-year-old hopes to strengthen the left wing of the Workers’ Party. 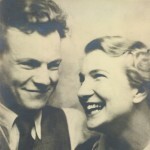 On 9 July 1933, Willy Brandt’s girlfriend, Gertrud Meyer, arrives in Oslo. In May she had been arrested for distributing anti-fascist leaflets and was subsequently imprisoned for five weeks. From now on, although not married, Willy and Gertrud live together as if they were. She plays an important role in the establishment of the Oslo headquarters of the SAPD. Like her partner, Gertrud becomes strongly involved in the local “Frihet” group of the AUF, the youth organisation of the Norwegian Workers’ Party. The Lübeck native also quickly gains a career foothold in Norway. In 1935, after working as a house maid and as a secretary, she becomes the assistant to the Austrian psychoanalyst Wilhelm Reich, whom she closely works with until 1941. Shortly after his arrival, with support of the DNA chairman Oscar Torp, Willy Brandt had actually received a work permit. However, police officials pressure him to leave Norway soon. Therefore Torp acts several times on the young German’s behalf and sees to it that Brandt receives a short-term residence permit valid until 1 September 1933. Nevertheless, the 19-year-old ignores the condition to abstain from “all political propaganda.” When the alien affairs police finally terminate his residency permit and try to deport him to Germany, Torp protests to the Minister of Justice and Brandt writes on 31 August 1933 to Jacob Walcher. The protest is successful. His residency permit is extended. In autumn 1933, Brandt becomes a member of the organisation, which includes around 100 members and resembles a fraternal order. His involvement in “Mot Dag” leads to severe conflicts with the leadership of the Norwegian Workers’ Party (DNA). Since the mid-1920s, any kind of co-operation with “Mot Dag” is forbidden to members of the DNA and its youth organisation AUF, of which Brandt is a member. Since his arrival in Norway, Willy Brandt has remained inexhaustibly active. In Oslo, he established a small SAPD cell which has held weekly meetings since autumn 1933. 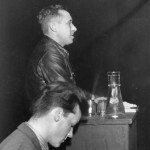 In addition, the young German writes articles and brochures, delivers lectures, supports resistance efforts in Germany and gets involved in the Norwegian workers’ movement. From 20 to 28 October 1933, Brandt travels to Stockholm to participate in a congress of the youth organisation of the Communist Party in Sweden (Kilbom-KP), which is independent of Moscow. In discussions there, he explores, among other things, the possibilities of establishing a new international youth organisation. In addition to that, the 19-year-old attempts to develop financial resources for the work of the SAPD. In early December 1933, Willy Brandt initiates the formation of a committee, along with three additional members of “Mot Dag” and two representatives of the youth organisation AUF. The group plans to secretly organise a left-wing opposition movement in the DNA to topple the party leadership under Martin Tranmæl and Oscar Torp. Shortly before that, the young German met with “Mot Dag” chief, Erling Falk, as well as with Tranmæl opponent, Olav Scheflo, and discussed the question of when and whether they can seize power in the DNA. With that goal in mind, Brandt begins to put together a network of like-minded persons in Norway. For that purpose, in January 1934, he tours the district of Telemark in the eastern part of the country and travels to Kristiansand, Stavanger and Bergen. On 12 February 1934, Willy Brandt visits Paris for the first time. Following discussions with comrades at SAPD’s foreign headquarters, he makes his way to Laren in the Netherlands to take part in an international youth conference for the SJVD, the SAPD’s youth organisation. Shortly after it is convened on 24 February 1934, the police raid the assembly and arrest its foreign delegates. Brandt is exceptionally lucky. On the advice of Finn Moe and Aake Anker-Ording, who remain at his side, he shows the police his Norwegian residency permit instead of his German passport so that he is thought to be a Norwegian. The other German participants at the conference are brought to the border and turned over to the authorities of the Third Reich. Brandt is taken with the other foreigners to a prison in Amsterdam, then put on a train to Brussels. On 27/28 February 1934, the conference of the left-wing socialist youth organisations is continued in the capital city of Belgium. To disguise its true nature, the meeting is called the “Lille Conference.” The delegates decide to found an International Office of Revolutionary Youth Organisations which is headquartered in Oslo starting in June 1934. Willy Brandt is one of the three secretaries of the office. Each month, the secretariat publishes an “International Youth Bulletin.” However, due to ongoing internal disputes, this international association never gets beyond the preparatory stages. From Brussels, Willy Brandt travels back to the French capital to the first foreign conference of the SAPD. After the arrest of the party leadership in Berlin in August 1933, Paris remains the only centre for the party. During the debate on theoretical guidelines and the SAPD’s struggle against fascism in Germany, Willy Brandt also contributes to the discussion. The 20-year-old leaves behind a vivid impression. A female friend of the photographer Gerda Taro writes in a letter that everyone was excited by the “fantastic young man” who is “considered one of the future key figures in the workers movement.” Not only she, but all of the young women, had fallen in love with him. On 18 March 1934, Willy Brandt returns to Oslo by way of Copenhagen. 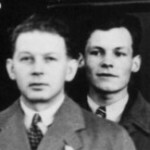 Because of Willy Brandt’s left-wing opposition and his connections to “Mot Dag,” Oscar Torp, the chairman of the Norwegian Workers’ Party DNA, takes the 20-year-old to task on 10 April 1934. Torp explains that, in light of his disloyalty, the party is not willing to continue to support him financially. In the heated discussion, the young German does admit to contacts and political agreements with “Mot Dag” but denies being a member of the group. Although Brandt continues his criticism of the DNA’s leaders, they discontinue their payments only temporarily. In late May 1934, Torp again intervenes on his behalf so that the German refugee will not be deported. As a result, the residence permit due to expire on 1 June 1934 is extended until 1 December 1934. 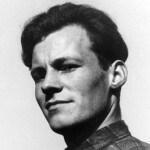 In mid-May 1934, at the congress of the AUF, the youth organisation of the Norwegian Workers’ Party DNA, many participants vent their dissatisfaction with Willy Brandt’s political viewpoints. He is accused of being a “spy” and a “factional opportunist.” A petition by the opposition in the AUF to grant him the right to speak is rejected by a vote of 102 to 63. Contrary to Brandt’s aspirations, the congress shows that for the time being, the left wing has no chance of taking over leadership of the youth group. In fact, the left-wing socialist continues to advocate a radicalisation and revolutionising of the Norwegian workers’ movement. However, he avoids a direct confrontation with the leaders of the AUF and DNA. Since autumn of 1933, Willy Brandt has been a member of the Marxist intellectual organisation “Mot Dag,” at whose meetings he frequently delivers lectures. On 21 June 1934, its executive committee makes him business and sales director of the elite group. By the second half of 1934, the young German belongs to the core leadership of the widely ramified organisation in Norway. Brandt also belongs to the editorial board of Fram Publishing Co., takes part in editorial meetings of the magazine “Mot Dag” and is, among other things, a member of an aid committee for Germany as well as of the International Commission. In addition, since June 1934 he has been writing contributions to a “Workers’ Lexicon” and to the first Norwegian edition of Karl Marx’ “Das Kapital.” His activity for “Mot Dag” contributes to assuring his substistence. 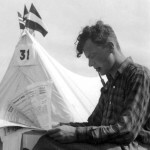 In mid-August 1934, Willy Brandt travels to an international youth conference in Malmö. Afterward he journeys to Copenhagen to discuss the political work of the SAPD in Scandinavia with party comrades. 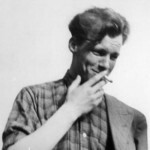 In May 1933, the young left-wing socialist has already spent time in the Danish capital during Whitsuntide and deliberated with friends about the activities of the resistance in Germany. Trips to Sweden and Denmark soon become routine for Brandt. During the 1930s, he also frequently makes stops in Stockholm and Gothenburg. 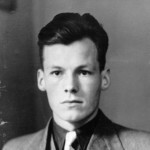 To improve his chances for an extension of his residency permit, Willy Brandt registers on 1 September 1934 as a student at the University of Oslo in the fields of modern history and philosophy. In late October 1934, he passes a preliminary examination in philosophy which is obligatory for all students. After that, Brandt does attend history lectures, but he does not complete a university degree. His studies are a side issue to him, whereas his political work continues to remain his principal concern. On 26 November 1934, the trial of 24 SAPD members begins at the NS People’s Court in Berlin. In Oslo, Willy Brandt organises a demonstration of solidarity for the political prisoners. In a letter to the Justice and Foreign Ministries in Germany, together with his “Mot Dag” associate Aake Anker-Ording, he brings 19 Norwegian attorneys together to protest the mistreatment of the incarcerated individuals and the application of retroactively enacted laws against them. Due to an initiative by Brandt’s partner, Gertrud Meyer, the justice fund of the Norwegian Workers’ Party DNA gives its financial support to the relief operation. Due to considerable international attention, the sentences by the People’s Court turn out to be relatively mild, for once. On 8 February 1935, Willy Brandt departs to Paris for the second time. After a conference of the”Internationale Arbeitsgemeinschaft (IAG)” (“International Alliance”), the umbrella organisation of left-wing socialist parties, the 21-year-old participates from 19 to 27 February in a meeting at the SAPD’s foreign headquarters. In a report, he criticises for the first time the Norwegian intellectual organisation, “Mot Dag,” which up to then has been a partner of the SAPD. He maintains that “Mot Dag” has acted arrogantly toward workers and has only a slight influence within Norway’s workers’ movement. 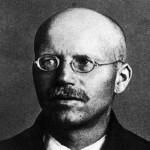 Brandt recommends that the SAPD distance itself from “Mot Dag” and become more strongly allied with the left-wing opposition within the Norwegian Workers’ Party DNA. Despite a few critical voices, the SAPD leadership approves this recommendation. On 11 March 1935, Brandt returns to Oslo. After his return from Paris, Willy Brandt becomes witness to a change of power in Norway. 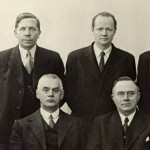 On 20 March 1935, after the collapse of the Mowinckel government, the Workers’ Party DNA forms a minority government headed by Prime Minister Johan Nygaardsvold. 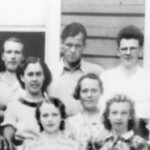 Brandt‘s attitude toward the change of power turns out to be ambivalent: On the one hand he sees DNA’s participation in the government as a chance to achieve improvements for workers and farmers and as a pre-condition for bringing about an assumption of power by the workers’ movement. On the other hand, he criticises the new government as far too willing to compromise with the king, the church and the bourgeois parties. Jacob Walcher and other SAPD members sharply deplore the fact that their young friend in Oslo does not completely reject the DNA’s position. At the Stockholm conference of his party’s Scandinavian exile groups, Willy Brandt’s attitude towards the DNA minority government in Norway makes quite a stir. 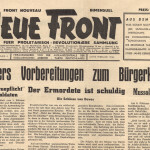 His German comrades intensely criticise his article which appeared shortly before in the SAPD organ “Neue Front” where he expresses cautious optimism about the Norwegian sister party’s participation in the government. They assert that the reform policies which the DNA is striving for “in the framework of capitalism” will only strengthen fascism. Brandt is accused of being infected by the reform notions of the Workers’ Party of Norway and its commitment to parliamentarianism. In spring 1935, Willy Brandt leaves the Marxist intellectual group “Mot Dag,” with which he has been associated for 1 ½ years. 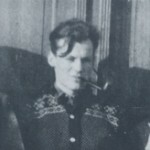 On 18 May 1935, in a letter to the SAPD’s foreign headquarters in Paris, the 21-year-old mentions as reasons for his decision the isolation of “Mot Dag” in Norway’s workers’ movement and the arrogance of the group toward ordinary workers. Brandt accuses “Mot Dag” of not criticising the policies of the DNA’s minority government, thereby weakening the left wing of the Norwegian Workers’ Party. He also complains about insufficient support for German refugees. After some hesitation, even Jacob Walcher in Paris distances himself from “Mot Dag.” After its leader, Erling Falk, becomes ill, the group disbands in June 1936. 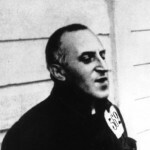 Since 1933, the German publicist Carl von Ossietzky has been imprisoned in various concentration camps of the Third Reich. In an attempt to help him and to enlighten the world about the situation of political prisoners in Germany, his friends initiate an international campaign. They nominate Ossietzky for the Nobel Peace Prize. In Norway Willy Brandt participates in the initiative. On 12 July 1935 in the “Arbederbladet,” he touts Ossietzky for the award. Through publications and letters as well as through conversations with Norwegian politicians, Brandt contributes to the success of the campaign. In 1936 the Oslo Nobel Committee awards Ossietzky the Nobel Peace Prize for the previous year. The concentration camp prisoner is unable to personally accept the prize. In 1938 he dies as a result of his incarceration. At a meeting in Copenhagen in late August 1935, accompanied by his girlfriend, Gertrud Meyer, Willy Brandt sees his mother, Martha, again for the first time since he fled Germany. The occasion could hardly be any sadder: In despair over the political situation in Germany and over his unhappy marriage, his grandfather, Ludwig Frahm, took his own life with a pistol on 15 June 1935. Brandt is devastated by the loss and realises how few ties he still has to his childhood in Lübeck. His complicated family circumstances also contribute to that feeling. In 1934, he had already learned through an uncle that his mother, Martha, is not the biological daughter of Ludwig Frahm. Since November 1935, Willy Brandt has led the Anti-Fascist Emigrant Committee in Oslo, which has been in existence for half a year. His deputy comes from the Communist Internationale (Comintern). Brandt is looking for co-operation with the communists in the struggle against Hitler and in founding a left-wing party of unity. Since August 1935, the chances for an anti-fascist alliance seem to have suddenly improved. Stalin’s Soviet Union and the communists loyal to it are no longer denigrating the social democrats and socialists as stooges of fascism, but rather are calling for a common front, particularly against the national socialists in Germany. However, Brandt’s plan for a fusion of the SAPD and KPD’s youth organisations gets nowhere. Due to distrust and controversy, the initiative soon fails. Late in 1935, Willy Brandt and his partner, Gertrud Meyer, move into an old four-room apartment on Hollendergata No. 2/III near the eastern train station. During their first two years in Oslo they have been living in small furnished rooms. 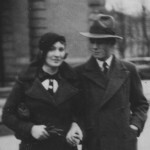 Not least due to Gertrud’s position with Wilhelm Reich, the couple has no financial worries and is relatively well off. Their home becomes the centre for the Oslo SAPD group and the “go-to” place for newly arrived party members. In September 1937, Willy and Gertrud will move to a newer apartment on the outskirts, in the district of Sinsen which is part of the municipality Østre Aker. The address is: Schouterassen Residential Block VII, 5th Floor. Since the change of course in Soviet foreign policy, consolidating all anti-fascist forces in opposition to Hitler and the Nazis seems possible. About 50 representatives of the German exile community start meeting at the “Lutetia” hotel in Paris in the autumn of 1935. On 2 February 1935, this body calls for the formation of a “German People’s Front” and forms a preparatory committee for this purpose. Beside sixteen social democrats and communists each, ten representatives of the SAPD are also included on the list of 118 co-signers. One of those is Willy Brandt, although he is not personally present. The SAPD foreign headquarters has full authorisation to make use of his signature. Among other co-signers of the declaration is the author and Lübeck native Heinrich Mann. Shortly before 1 May 1936, Willy Brandt again visits the French capital, which he gets to know more closely for the first time. At first he stays in a small hotel in the Latin Quarter, then at the home of Jacob Walcher in the suburb of Les Plessis-Robinson. In Paris, Brandt is seized by the atmosphere of positive change which has prevailed since the electoral victory of the left in France, which is accompanied by the formation of a people’s front government. During his five-week stay he participates, among other things, in a meeting of the “Internationale Arbeitsgemeinschaft (IAG)” (“International Alliance”) and in a congress of French trade unions. His activities centre on consultations with the SAPD leadership and assemblies of German exiles. The overriding purpose is to form a German people’s front against the Nazi regime. On 7 June, Brandt returns to Oslo. On 4 July 1936, Norway and Sweden sign the Geneva Convention on Refugees. By doing so, both nations are obliged to issue identification papers to all refugees living in their territories, the so-called “Nansen passport.” By this means, Willy Brandt receives a Norwegian alien’s passport issued in the name Herbert Frahm. His German passport expired on 1 July 1936. 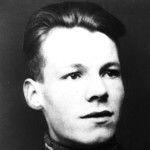 In August 1936, Willy Brandt receives a letter from Jacob Walcher in Paris, according to which he should prepare himself as soon as possible for a mission with “Metro.” On behalf of the SAPD foreign headquarters, the 22-year-old is supposed to make contact in Berlin with ca. 200 SAPD comrades who are still offering resistance in the underground, but have been without leadership for several months. Brandt does express considerable doubts but does not refuse the dangerous assignment. During his stay in Berlin he plans to assume the identity of a Norwegian student. For that purpose, the Norwegian Gunnar Gaasland, the fictitious husband of Gertrud Meyer, provides his own passport to Brandt in which a photo of the young German is inserted. Around 18 September 1936, Willy Brandt leaves Oslo and travels to Paris to prepare for his mission. Allegedly in early October 1936, Willy Brandt takes a train from Paris to Berlin. In disguise as the Norwegian student Gunnar Gaasland he remains in the capital city of the Reich until shortly before Christmas. He lives in a sublet room at the corner of Kurfürstendamm and Joachimsthaler Straße. Each morning the 22-year-old “studies.” In the Prussian State Library he concentrates on Nazi ideology, reads newspapers and magazines. In the afternoons, in the early evening and on weekends, Brandt meets in secret with SAPD members. With considerable good fortune, the true identity of the Norwegian student remains unknown. 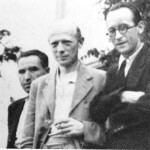 Brandt writes an article which appears anonymously in March 1937, based on the impressions that he gains in Berlin concerning resistance by underground groups against the Nazi regime. After spending Christmas together in Prague, Willy Brandt and Gertrud Meyer travel to Brünn in late December. A long-planned party conference of the SAPD is supposed to take place there. However, on short notice, the meeting, camouflaged as the “Kattowitz Conference”,is relocated to the Moravian town of Ostrau. The gathering in early January 1937 is rife with controversy. The 17 delegates, among them Brandt and Meyer, hold differing opinions about the future course of the SAPD in the resistance. Due to the minute chances for their small party to be effective, Jacob Walcher and Willy Brandt advocate stronger co-operation with the communists and with left-wing social democrats from the group “New Beginning.” Their goal is the formation of a revolutionary party of unity. By contrast, some comrades insist without compromise on an independent direction for the SAPD. Soon afterwards this strife leads to a schism in the party. The conference ends with a personal disappointment for Willy Brandt. He is not elected to the innermost circle of party leadership because older delegates consider him too young. However, the 23-year-old leaves a powerful impression on Stefan Szende, whom he had met in Paris shortly before. The two develop a life-long friendship which is especially close during their years of exile together in Sweden. Following the “Kattowitz Conference,” Willy Brandt attends a youth conference of the “General Jewish Labour Federation in Poland” in Warsaw. On 12 January 1937, he returns to Oslo by way of Danzig and Copenhagen. Soon after his arrival back in Oslo, Willy Brandt receives a summons from the Norwegian police. An official questions him concerning his names, income, political activities, trips abroad and his German passport. 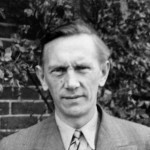 In spite of this interrogation, Brand soon leaves Norway again on 14 February 1937 for a lengthy stay abroad on assignment for the SAPD. By way of Denmark and Antwerp (Belgium), Willy Brandt first travels to Paris in the company of the Norwegian journalist Per Monsen. There they obtain visas for a further journey to Spain. Franco’s fascists and the troops of the republic have been fighting each other since July 1936. During a visit to the Aragonian front in Huesca in March 1937, without ever lifting a weapon himself, the young German experiences the merciless cruelty of the war. Brandt is also actively involved with the “Committee on Aid for Spain” which was initiated by the Norwegian Trade Union Federation. It supports hospitals and children’s homes and distributes medicine and food to the needy population. Especially depressing are the bloody conflicts in the Republican camp. Communists loyal to Moscow are taking forceful action against anarchists and “Trotskyites.” Several left-wing politicians disappear without a trace, among them a friend of Brandt. They were supposedly murdered by agents of Stalin. Disappointed and depressed, Willy Brandt departs Spain on 25 June 1937. In summer 1937, Willy Brandt spends several weeks in Paris. In early July he reports on his experiences in the Spanish Civil War at a meeting of the expanded SAPD leadership. Brandt characterises the battle between Franco’s troops and the Republican organisations as the “preliminary engagement in a great, inevitably approaching international conflict between fascism and socialism.” He denounces the communists for subverting the unity of the workers’ movement by persecuting left-wing forces in Spain. In Paris, Willy Brandt also meets the Dutch trade unionist Edo Fimmen. The chairman of the International Federation of Transport Workers (ITF) maintains a network of contacts through which seamen smuggle anti-fascist materials into Germany. In early August 1937, Willy Brandt leaves Paris and travels to the British Isles for the first time. In Letchworth, north of London, from 8 until 12 August, he participates in a meeting of the “Internationale Arbeitsgemeinschaft (IAG)” (“International Alliance”), the umbrella organisation of left-wing socialist parties. At the conference, Brandt is attacked fiercely as the representative of the SAPD. Ultra-left-wing sectarians even accuse him of having denounced the Austrian Kurt Landau to the communists. Landau, who was in hiding for months, is eventually abducted in Barcelona in September 1937 and is never heard from again. Brandt vigorously refutes the untenable accusations with which he will be confronted again at a later time. From 16 to 21 August, Willy Brandt attends a conference of the Socialist Youth Organisation of Germany (SJVD), the youth organisation of the SAPD, in the south of Sweden. Based on his proposal, it is decided that the SJVD will pull out of the International Bureau of Revolutionary Youth Organisations. Those in attendance also advocate co-operating with those social democratic junior staff members in the Socialist Youth Internationale (SJI), who stand for unity in the workers’ movement. At this meeting, Wilhelm Reich also delivers an address. The initiative for this speech originated with Willy Brandt who corresponded intensely with the psychoanalyst during his sojourn in Spain in spring 1937. 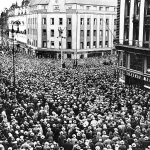 On 22 August 1937, Brandt returns to Oslo. 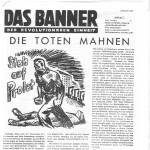 On 27 September 1937 in Oslo, German left-wing socialists, communists and left-wing social democrats found, with Willy Brandt’s participation, the journal “Det skjulte Tyskland” (“The Hidden Germany”). The project is launched in the house of Johan Vogt and his wife Gerd. On this date the diary of the Norwegian economist shows the following entry: “Today we prepared an important task which shall make a contribution to ally our Germany with our Norway. Thanks to Gerd and Johan Vogt that they offer us the space for it. 27/9/1937 Willy Brandt”. The new publication is meant to enlighten the Norwegian public about the situation in the Third Reich and inform them about the resistance work of political refugees. The organ of the “Arbeitsgemeinschaft Oslo” (“Oslo Working Group”) led by Brandt will appear regularly until May 1939. In mid-October 1937 in Gothenburg, Willy Brandt takes part in a meeting of German social democrats, left-wing socialists and communists from Norway, Denmark and Sweden. 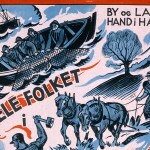 It is the high point of the unity and people’s front activities by German exiles in Scandinavia. Afterward, in a letter to the SAPD leadership in Paris, Brandt expresses considerable satisfaction with the fact that concrete resistance work was the focal point at the conference instead of theoretical discussions. During Willy Brandt’s month-long absence, some changes occurred in Oslo. Among the newly arriving German-speaking exiles are more and more social democrats whom the Norwegian Workers’ Party DNA strongly turns to. Even within the small Oslo SAPD group, a change of personnel has come about. Older and academically trained party members have drawn together and now call Brandt’s leadership role into question after his return. After the majority of the group has withdrawn its confidence in him, Willy Brandt and Gertrud Meyer resign all of their offices on 8 November 1937. Nevertheless, Brandt is once again elected to the collective group leadership in late November. However, the compromise cannot hide the fact that the SAPD cell is deeply divided. During the first two months of the year 1938, Willy Brandt travels frequently around Norway to deliver lectures in cities and towns. In Torp, 100 km south of Oslo, he speaks on 5 January 1938 about the situation in Spain. From late January to mid-February, the 24-year-old stays in the west of Norway where his schedule includes appearances at the Arbeidersamfunn in Høyanger and in Bergen. 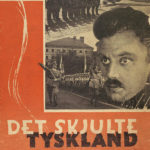 The titles of the lectures there are: “5 års Nazistyre – De tyske arbeidernes kamp for bedre kår” (“5 years of Nazi rule – The German workers’ struggle for better conditions”) and “Nazismens krise” (“The crisis of Nazism”). Having smouldered for months, the conflict in the SAPD cell in Oslo again breaks out openly in spring 1938. The majority denounces Willy Brandt for “disloyal and autocratic methods” and refuses to co-operate with him any longer. At the re-election of the chairman, he loses to his opponent, Paul Wassermann, with three to seven votes. However, Brandt refuses to recognise the results and appeals to the SAPD foreign headquarters in Paris. In September 1938, after the failure of conciliation attempts, the leadership of the party decides against Wassermann. Immediately afterward, he and eight additional members of the SAPD resign from the party. By year’s end the Oslo cell practically does not exist anymore. From 24 June until 11 July 1938, Willy Brandt accompanies members of the Norwegian Municipal Workers’ Union on a tour through the Netherlands and Belgium. The group travels by ship from Oslo to Rotterdam by way of Kristiansand. Additional stations are: The Hague, Scheveningen, Amsterdam, Hilversum, Alkmaar, the Zuider Sea, Brussels, Charleroi and Antwerp. Brandt acts as the group’s interpreter and is the delegation’s speaker at all official occasions. 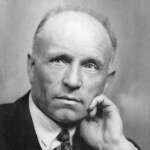 As the union’s organ reports: “He appeared with a dignity and intelligence which awakened our admiration and resulted in our being treated everywhere with demonstrations of respect.” After his return, Brandt remains only a few days in Oslo before leaving on 17 July 1938 for another trip to Paris. Willy Brandt again spends a summer in the French capital. 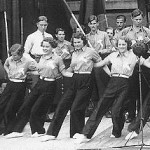 On 23/24 July 1938, he takes part in a conference of the “Freie Deutsche Jugend (FDJ)” (“Free German Youth”), which has existed since January 1936 as the common platform of the communist and left-wing socialist youth associations. On 27/28 August 1938, a session of the “Internationale Arbeitsgemeinschaft (IAG)” (“International Alliance”) takes place in Paris. However, since this umbrella organisation of left-wing socialist parties is only an assembly of contentious sectarians, Brandt leaves the meeting prematurely. Shortly afterward, the SAPD withdraws from the IAG. On 20 September 1938, the 24-year-old also experiences the definitive failure of the German people’s front. One fourth of its participants, Brandt among them, refuses to sign declarations authored by the communists. It takes the Gestapo five years to realise that Herbert Frahm and Willy Brandt are one and the same person. As with thousands of other opponents of Hitler who have fled abroad, the Nazi officials revoke his German citizenship because of his opposition. 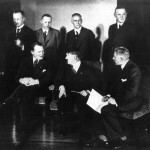 The corresponding legal action against Frahm/Brandt is convened in mid-March 1938. The deprivation of his German citizenship occurs on 5 September 1938 by means of an announcement in the “Reichsanzeiger” (“Reich’s Official Bulletin”). Nevertheless, the files show that the German secret police have relatively little information about Brandt and his activities in exile. 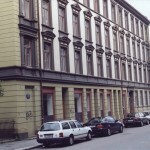 Briefed by the German embassy in Norway, the Gestapo in Berlin, however, knows his residential address in Oslo since 1937. In the course of the year 1938, Willy Brandt‘s relationships with the workers’ movement in Norway become closer and closer. In autumn 1938 he becomes the secretary of the “Den norske Hjelpekomité” (“Norwegian Aid Committee for Spain”). Although he continues to have no official work permit, Brandt is active there as its press relations officer. He holds lectures on Spain and writes for the Norwegian workers’ press. 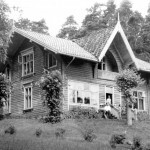 Additionally, in 1938/1939, Brandt teaches introductory courses on union activities at the Workers’ Academy on the island of Malmøya. In an article for the Norwegian magazine “Det 20de århundre”, Willy Brandt criticises the compliancy and weakness of the western powers which would only continue to increase Hitler’s appetite. He asserts that the Munich Agreement has strengthened the Nazi regime at home and dealt a major setback to German opposition forces. The 25-year-old has no doubt that Hitler wants to conquer all of Eastern Europe through a war. 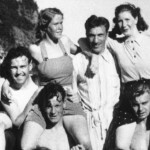 In May 1939, Gertrud Meyer leaves Oslo and travels by ship to New York. There she is supposed to make preparations for Wilhelm Reich’s move to the USA. It is unclear if the relationship between her and Willy Brandt still exists or if this is only a temporary separation. Brandt assesses with scepticism any talk of emigration to America. The fundamental prerequisite for that is Norwegian citizenship. However, approval of his application for naturalisation keeps being delayed. Besides, it is still uncertain what the SAPD leadership has planned for him. In spring 1939, Jacob Walcher suggests that the 25-year-old could move to Paris. Shortly thereafter, it is suggested that Brandt should go to London. The outbreak of war in September 1939 throws a spanner in the works. Since he has been stateless since September 1938, Willy Brandt has applied for naturalisation in Norway. However, in late June 1939, the Justice Ministry in Oslo temporarily puts his application in abeyance. Brandt has actually fulfilled the minimum requirement of five years residency in the country. But he cannot produce proof of having regularly paid taxes. He was unable to pay taxes on his income in Norway because one is not allowed to be gainfully employed without a work permit. In any event, the 25-year-old is granted a permanent residency permit which before was extended perpetually for a half year at a time. 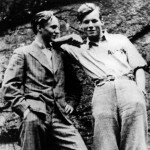 Since they both are residing abroad and the prisoner steadfastly refuses to divulge any information about them, the procedure against Brandt and Reich is continued in late July 1939 by the now responsible chief prosecutor of the Reich at the People’s Court of Justice in Berlin. Ultimately, it never comes to an indictment or trial of either one. But even as late as 1943, the People’s Court of Justice still requests from the Gestapo new information on the suspects. In a surprising move on 23 August 1939, the foreign ministers Ribbentrop and Molotov sign a German-Soviet non-aggression treaty, the so-called Hitler-Stalin Pact. The agreement by the previous deadly enemies is supposed to be valid for 10 years. With that, Hitler-Germany has free rein to wage war against Poland. In a secret supplemental protocol, the German Reich and the Soviet Union agree on the partition of Poland as well as on defining their respective spheres of influence in the Baltic region, in Finland and in Bessarabia, which belongs to Rumania. Left-wing anti-fascists such as Willy Brandt are outraged by the Hitler-Stalin Pact. With that, the Soviet government has “not only placed itself outside the socialist workers’ movement, but also outside anti-Nazism,” Brandt writes in October 1939 in a brochure about the “Foreign Policy of the Soviet Union 1917-1939.” The Soviet system, with which he and the SAPD sympathised until the mid-1930s, is now decisively rejected by the 25-year-old. As Brandt asserts, “Experience demonstrates that socialism is more than the acquisition of means of production by the state. Socialism has to be established on a basis of freedom and democracy.” Several months prior, he already sharply dissociated himself from the Communist Internationale (Comintern), which is controlled by Moscow. On 1 September 1939, the German Wehrmacht invades Poland. Two days later, Great Britain and France declare war on Germany, however without intervening in the fighting. Within a few weeks Poland is defeated. Furthermore, on 17 September 1939, Soviet troops march into the eastern part of the country. The partition of Poland agreed to in the Hitler-Stalin Pact is sealed. On 30 November 1939, the Soviet Union attacks Finland because the government there will not agree to its territorial demands. Especially in Scandinavia, the attack unleashes considerable outrage and a surge of solidarity with the Finnish people. Willy Brandt considers the Soviet action to be “total insanity.” In the Norwegian journal “Det 20de århundre,” he asserts in early 1940 that the entire socialist workers’ movement must clearly dissociate itself from the Soviet Union. Everywhere in the world, Stalin’s policies signify a strengthening of anti-socialist forces and elements “hostile to workers,” Brandt writes. The Winter War ends in March 1940 with the Moscow Peace Treaty. Finland remains independent, but has to accept territorial losses. Since autumn 1938, Willy Brandt has been secretary of the “Den norske Hjelpekomité” (“Norwegian Aid Committee for Spain”) for which he works in Oslo as its press representative. Even in December 1939, when the aid committee renames itself the “Norsk Folkehjelp” (“Norwegian People’s Aid”), he keeps his position. The People’s Aid is a social organisation of the Norwegian workers’ movement. It operates not only charitable institutions in Norway, but also provides humanitarian aid abroad. 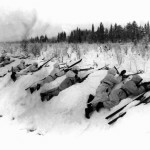 Therefore, the People’s Aid supports the civil victims of the Finnish-Soviet Winter War. With that purpose in mind, as chair of a solidarity committee, Brandt calls for monetary and material contributions. The 25-year-old is also sought after repeatedly as a lecturer at educational institutions.